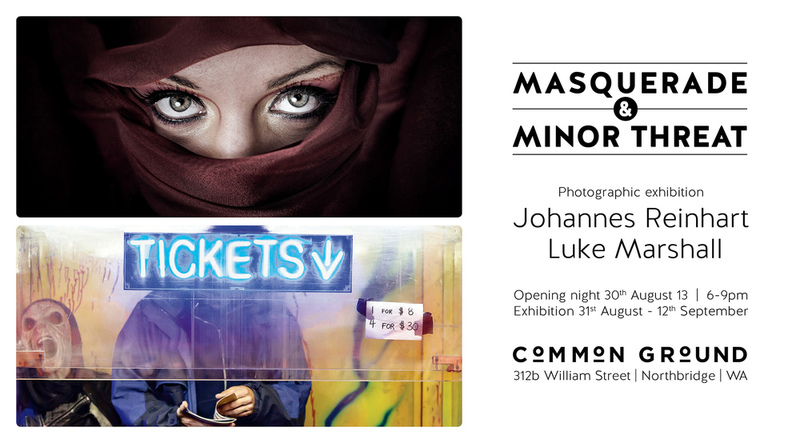 Two award winning photographic artists, Johannes Reinhart and Luke Marshall, have teamed up to put on a combined exhibition. Running for two weeks, from 31st August to 12th September at the Common Ground Gallery in Northbridge, the exhibition is the culmination of several years of work from the two artists. In Masquerade, Johannes Reinhart explores costume and concealment and how the simple act of putting on a mask can reveal as much as it disguises. Evoking memories and half-remembered childhood stories, Reinhart's images drift from dreamlike to documentary, but never quite return to reality. In Minor Threat, Luke Marshall highlights the surreal world of the sideshow. Taken over three years at the Perth Royal Show, Marshall's photographs invite the viewer to examine how we interact with others and what we choose to reveal about ourselves. The exhibition includes Marshall's image, "$8 per Rider", winner of the 2012 Iris Award from the Perth Centre for Photography. With his work we explore the world of the ticket seller and the divide between us and them. Confined to their boxes and stalls, we wonder, are the cages there to protect them from us, or us from them? Visit my collaborator, Johannes Reinhart. I'll be presenting my work and discussing some of the ideas and thoughts that went into it. Come and seem me enthusiastically babble and chatter like a madman. It will be fantastic and ridiculous and wonderful, until it isn't! Media release and press kit available here.